April 4th 1968; Dr Martin Luther King, was assassinated. Dr King was shot dead in the southern US city of Memphis, Tennessee, where he was to lead a march of sanitation workers protesting against low wages and poor working conditions. He was shot in the neck as he stood on a hotel balcony and died in hospital soon afterwards. 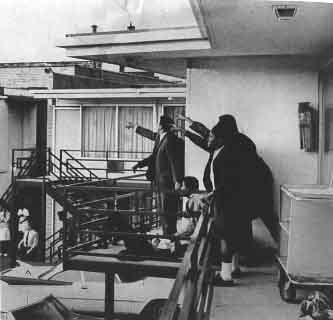 Reverend Jesse Jackson was on the balcony with Dr King when the single shot rang out. "He had just bent over. I reckon if he had been standing up he would not have been hit in the face," said Mr Jackson. Police in Memphis were put on alert for a "well-dressed" white man who is said to have dropped an automatic rifle after the shooting and escaped in a blue car. There were early signs of rioting in Memphis after Dr King's death and 4,000 members of the National Guard were drafted into the city. A dusk-to-dawn curfew has been ordered to ward off disturbances. The US President, Lyndon Johnson, has postponed a trip to Hawaii for peace talks on Vietnam. The president said he was "shocked and saddened" by the civil rights leader's death. "I ask every citizen to reject the blind violence that has taken Dr King who lived by non-violence," Mr Johnson said.